Take a stately tour into the wooden architecture of Taltsy Village or gaze out your window at the devastating wilderness of Siberia where comfort on wheels takes on a whole new meaning. Let’s have a look at what that entails, from purchasing tickets to standing before the Winter Palace. Where you will go, what you can expect and how we can help. Crossing Eurasia with a Trans-Siberian tour is probably the ultimate adventure-of-a-lifetime and a bucket list item for many globetrotters. Unforgettable experiences from seeing breathtaking sights and getting to know the life of the locals are what make any Trans-Siberian tour a journey-of-a-lifetime. However, choosing one of the luxury Trans-Siberian trains out there is an entirely different mode of travel. It’s like taking a ride through Russia, Mongolia and China in a posh ‘Ritz-Carlton’ like ‘hotel-on-wheels’: with gourmet dining, exciting lectures on-board, en-suite amenities and plenty of opportunities to make friends with other travelers from all over the world. Let's have a look at what you can pick from and prepare you for making this decision. There are four noteworthy luxury Trans-Siberian trains operated by private companies: the Golden Eagle, Tsar’s Gold, Grand Deluxe Trans-Siberian and a brand-new Imperial Russia. The Imperial Russia train is where we start. Its uniqueness makes it one of the most sought-after trains for this journey. First of all, it is a brand new train only making its first journeys in 2014. It also takes you slightly off the beaten track to the beautiful Omsk, Tobolsk and Novosibirsk - less popular Trans-Siberian destinations, but no less charming. In terms of comfort, the Imperial Russia can be compared to Hilton or Marriott class hotels, not luxurious but very high-end and high-comfort. The cabins are big and neat. 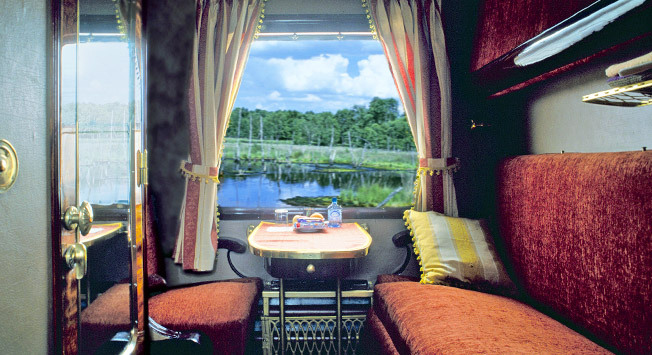 Superior classes offer en-suite showers, 2 luxurious dining cars serve delicious Russian cuisine along the way. It is a brand new train. And the hotels arranged along the way are not the highest, but near the top in luxury. It's claim to fame is that it is brand new this year, near the top of luxury trains in Siberia, and comes with unique travel itineraries and reduced prices for the 1st year en-route. Next, we introduce you to the Golden Eagle, standing at the very tippy top in luxury. Contrary to the Imperial Russia's youth, the Golden Eagle is seasoned and historic. It is a stately and “wise old man” of a train. In fact, it is one of the best luxury trains in the world. The rooms are the biggest of all Trans-Siberian trains and the amount of choices in amenities will suit and impress all travelers. Champagne is served on board, there is also L’Occitane toiletries and 24/7 attendant service, to name just a few. A special thing to note is that this train is led by the P36 Locomotive that has one of the oldest steam engines on the rails. When compared to a hotel the Golden Eagle is a ‘Four-Seasons-on-wheels’. All in all, if you seek unprecedented luxury, look no further. But be prepared to give 20k+ for a 2-week journey on-board this unique private Trans-Siberian train. In comparison, the Imperial Russia rates start from 5k for a similar program. Last but not least, the Tsar's God and the Grand Trans-Siberian Express are two very popular options for very specific reasons. Both of them offer quality, space, privacy, and ‘close-to-the-top’ level of luxury. However, each has its own unique perks. The Tsar’s Gold is the oldest private train on Russian tracks (this doesn’t mean less comfortable as these trains are renovated almost every season). Its rooms are large and it offers German precision and quality in all amenities and arrangements, as it is owned by a German company. If compared to a hotel the Tsar’s Gold is of ‘Kempinski’ class. It has spacious cabins of premium comfort. One special feature of this train is its Nostalgic carriage: with cabins furnished in the style of old Soviet trains Communist leaders used to travel in. This will definitely enhance your overall experience (but be prepared as the Nostalgic cabins offer shared showers only). The Grand Trans-Siberian Express is also a German-run train. In terms of comfort it stands at the same level as the Imperial Russia. It also has a wider selection of regular cabins and more affordable rates than the Tsar’s Gold. This trains special feature is its live piano in the lounge car. A luxury tour through Siberia is something unrivaled in the world of tourism. While cruises are 5-star hotels on water, these trains are 5-star hotels on the rails. Sliding across the tracks in the privacy and luxury of a train through Siberia is like entering a new world. We hope this brief guide to luxury Trans-Siberian trains helps you pick the best option for your once-in-a-lifetime journey across Eurasia. About the author: Slava Shirokov is a Russian native, keen traveler and a CEO at Travel All Russia, a destination management company specializing in Russia. He grew up in the Russian Far East and has made the Trans-Siberian journey twice.